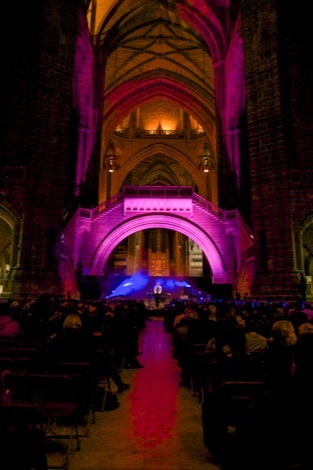 Low brought about another form of worship at one of the world’s most beautiful buildings, Getintothis’ Alan O’Hare got a pew and offered up high praise. Names of bands and artists are flying around like holy water on a Sunday. We’re just outside the Anglican, on a miserable Monday night, and the debrief has started: “It sounded like The Velvet Underground“, “a bit like Godspeed You! Black Emperor“, “Neil Young is in there” and so on. But we’re all just excited. As, the truth is, what we’ve just witnessed sounded like nothing we’ve heard before. It was deep, dark and truthful. 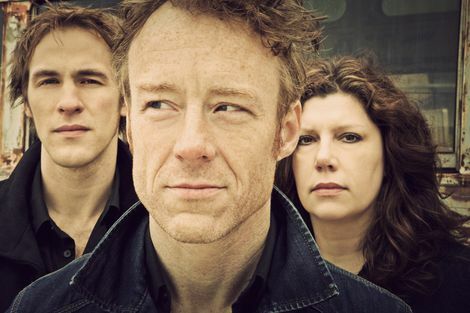 Low bring the bottom end like no other band – sure, it’s heavy, but it’s melodic and filled with beauty and wonder too. How many drummers play with such grace that you can describe their beats as notes? Mimi Parker does – her ride fills have hooks better than most guitar riffs out there. New boy Steve Garrington’s bass lines are unfussy and in the pocket too, while his piano playing is perfect and reveals itself as gospel in this stunning environment. 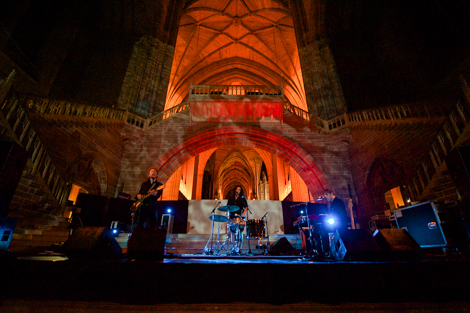 Fair play to promoters Harvest Sun, Low at the Anglican Cathedral was a match made in heaven. Pre-match worries about the sound dissipated too; before the climax of opening song Words, the mix was right. Plastic Cup, Holy Ghost, Just Make It Stop and Dragonfly sound great and the band are into their groove. The near sell-out crowd (another feel good factor) sit in hushed reverence and even main man Alan Sparhawk is moved to make reference to the well in which we sit. The gig just worked. True, long-time fans have waited many years for the Duluth, Minnesota group to come to the city, and their early work was (mostly) set aside for new tunes, but, for us, that just shows what a great band this really is. The music is doom-laden, Old Testament and filled with ghosts of the past: Lou Reed’s in the corner, digging the drones; Johnny Cash, seated at his right hand, is taking notes on the lyrics and Hank Williams lifts his head from the Communion wine to nod his approval. 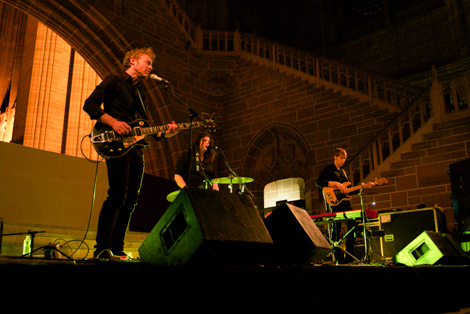 Low makes modern American music all of their own and the sound suited the gothic surroundings of a winter’s night down Hope Street. One cover of Rihanna’s Stay later and it’s all over. A leftfield finish? Not in practice: leaving the building to the beautiful vocals of Mimi Parker was another perfectly positioned pick. What a night. 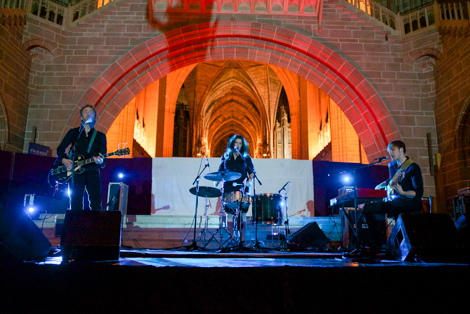 Low: Liverpool Anglican Cathedral – who’s next to deliver songs of praise?